meghan eats local: Guess What I Wear as a Hat? A Lentil. The lentil meal I just cooked was inspired by Amanda Ehrman and Isis Krause at GOOD. They've been posting delicious vegetarian lunch recipes every Tuesday and Thursday in 2011. They find soup and salad recipes, prepare them, then photograph and rate their results based on taste, cost, and prep time. It's a great idea, and really helpful for aspiring healthful eaters like me! I was excited about the recipe they posted for lunch today, Really Easy Lentil Soup, especially the "really easy" part. I love lentil soup (my Nonna used to make killer lentil soup for me when I was little). So far in my vegan life, I've been pretty satisfied with heating up a can of Trader Joe's Organic Lentil Vegetable Soup. But the homemade version of things is usually better, so I decided to give this recipe a try. I had to make a trip to the Isla Vista Coop for some of the ingredients, but it was a gorgeous day out so I wanted an excuse to go on a walk anyway. I changed the recipe posted by Amanda and Isis at GOOD in three ways. First, I had green garlic from the Community Supported Agriculture box, so I wanted to use that instead of purchasing cloves of garlic. Second, tomatoes are not in season here so I didn't want to purchase them (and I'm not a huge fan of tomatoes in soup, anyway). And third, I don't really like leeks, so I left those out. It was less like a soup and more like... a pile. 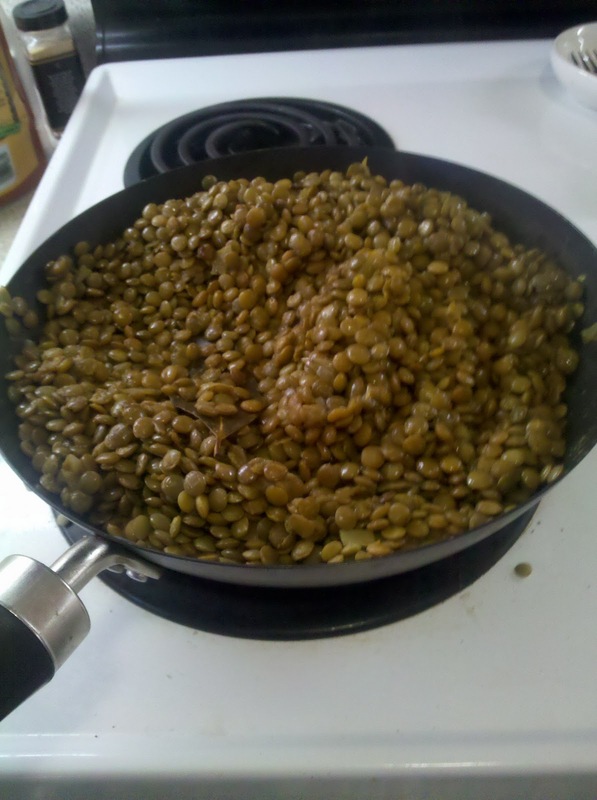 A big pile of cooked lentils. 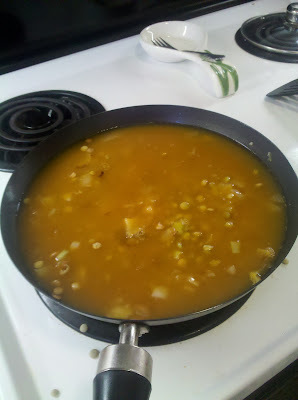 In the future, I'll use more vegetable broth and learn how to simmer properly. But it still tastes delicious, thank goodness! And now I can have lentil soup whenever I want it, for the next year or so. :) Woks get a lot hotter than soup pots, so the liquid evaporates a lot more quickly. But, looks yummy! oh that would be a pretty weird hat if you are really wearing it, but I would love to see it haha, nice recipe thanks for sharing it!